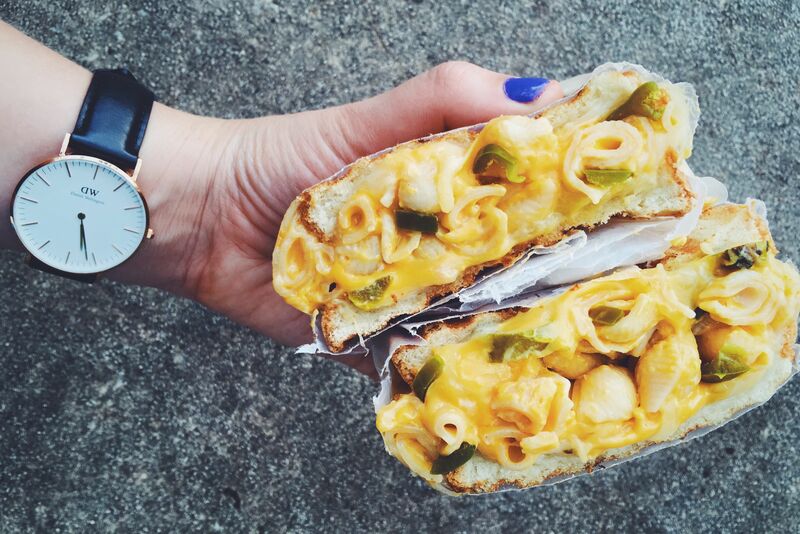 Did someone say spicy jalapeno mac n cheese grilled cheese? That's right! And with this quick and easy recipe, feel free to use any leftover mac n cheese you have on hand or follow my recipe for my take on it. If you're having a hard time imaging how all that mac n cheese doesn't fall out of the sandwich, don't worry, there's a trick...by letting the pasta get cool and firm, the sauce basically creates a cheesy glue which holds everything together. This Roasted Chicken Caprese sandwich is a take on the classic caprese sandwich is typically loaded with a bunch of fresh mozzarella, a few tomato slices, and torn basil which are then lathered with a olive oil and balsamic vinegar, salt and pepper. And although this sandwich isn't all that bad to begin with, we created a healthier version by hollowing out a whole grain baguette and adding rotisserie chicken for protein. We replaced olive oil with flavorful truffle mustard and white balsamic glaze. And instead of the traditional fat slabs of whole milk mozzarella, we swap out tiny pearls of the fresh cheese to cut down on fat. Arugula gives the sandwich a nice peppery bite and adds a bunch of vitamins such as A, K, and C as well as folate and calcium. The tomatoes are not only a great form of antioxidants but are also packed with lycopene which helps prevent cancer. Not too shabby, huh? Here's my rendition of a quick and easy chicken parmesan sandwich. I always recommend using organic or local ingredients because.. I swear... it just tastes so much more real. This simple yet decadent bacon and butternut squash grilled cheese is perfect for the changing of seasons! Sautéed butternut squash, crispy bacon, and melted gouda come together between two buttery toasted slices of bread to create a sweet and savory sandwich that highlights the beautiful flavors of Fall. If you're looking for the perfect summertime food then this Spicy Tuna and Avocado Sushi Burger is for you! Made with leftover sushi rice and topped with avocado, spicy tuna, sriracha, eel sauce, kewpie mayo, cilantro and crispy fried garlic, this fresh spin requires barely any cooking which makes it perfect for the hot days of summer. Are you looking for a new way to spice up chicken salad sandwiches? Try this mouthwatering Chimichurri Smoked Chicken Sandwich version with smoked chicken breast, zesty chimichurri, fresh grilled corn, and peppadews. This grilled macaroni and cheese sandwich is filled with tender braised short ribs and umami-rich steak sauce. I used Velveeta macaroni and cheese because it was all I had on hand, but you should totally use some of the good stuff. I recommend using one of our Southern Food Expert's mac n cheese recipes because she has about a million of them and they all look amazing. This quick and easy meatloaf sandwich recipe is perfect for utilizing leftovers in the most delicious way possible. Spaghetti and meatballs is a classic dish, no doubt. Pretty much everyone loves it but have you ever thought about making it into a grilled cheese sandwich?! Probably not... I know, it's kind of weird but after some experimentation, I discovered that turning this dish into a sandwich is totally awesome. It's crispy, garlicy, cheesy, and rich – basically everything that is good in the world. This Meatball Smash Grilled Cheese calls for pre-made ingredients (or leftovers if you will) but you could totally make this from scratch and I'm sure it would be even better! You're probably familiar with this delicious Fall turkey sandwich composed of the following Thanksgiving leftovers: Thick slices of roasted turkey breast with sweet and tart cranberry jam, fresh spinach and rich and creamy brie between two beautiful pieces of white bread. And although this sandwich is typically only seasonally available - fear not - you can totally make it any time of year. 1. Instead of using leftover turkey from Thanksgiving, try finding roasted turkey breast at your local neighborhood deli or meat market. If you can't find it, try swapping it out for some slices of rotisserie chicken. 2. Don't have cranberry? Try using a chutney, apple butter or a nice raspberry melba sauce. 3. Don't like brie or would rather try another cheese? This sandwich would be insane if you found a beautiful cheddar-blue such as Dunbarton Blue from Wisconsin or a nice sharp white cheddar. Want your kids to eat more veggies but are having a hard time doing so? Try grilling up this tasty grilled broccoli macaroni and cheese sandwich... it's stuffed with delicious and nutritious broccoli florets. Also, this recipe calls for leftover macaroni and cheese, but it can totally work if you make it on the spot as long as you let it cool and thicken up for a bit. I recommend following this recipe if you don't have some already on hand. Perfect for breakfast, lunch or dinner, this delicious biscuit sandwich recipe is stacked high with a crispy boneless Southern fried pork chop, sharp cheddar cheese and sweet spiced apples. If you love the McRib but are uncertain of McDonald's meat choices, then make it yourself with this delicious copycat McRib recipe! Made with tender pulled pork ribs, chopped white onion and a dill pickle, this version of a fast-food classic is all grown up. Don't have ribs on hand? Try it with pulled pork, barbecue chicken, or smoked turkey. If you're vegetarian, try using the rib marinade with pulled jack fruit, tempeh or tofu. Want to learn what it takes to make the perfect Grilled Macaroni and Cheese Sandwich? Get my recipe and background right here! I've been writing a grilled cheese blog (GrilledCheeseSocial.com) for almost 4 years now, but If you had to guess my second favorite food what do you think it would be? I'll give you a little hint, it's almost exactly like a grilled cheese but a wee bit different..... give up? Ok, alright, yeah fine i'll tell ya. The answer is mac n cheese! Surprised? I didn't think so! And because I'm such a freak about cheese being melted on anything I've combined my loves to create one special meal - a grilled macaroni and cheese sandwich! Want to spice it up a bit? Try adding a bit of sriracha or a fried egg and some bacon. Try this delicious roasted chicken torta! Pulled rotisserie chicken, chipotle black bean spread, tomatoes, pickled red onions, queso fresco, salsa verde, cilantro and fresh avocado are piled up in a hallowed out torta bun to make a healthier version of this Mexican classic. In this awesome Honey Sriracha Brussels Sprouts Bao recipe, crispy fried pork belly, a sweet and spicy honey-Sriracha sauce, chopped peanuts, and soy sauce glazed brussels sprouts are packed into a light and airy steamed bun. This Grilled Cheese Sandwich with Sausage and Kale is Inspired by one of my favorite warm soups, and is a satisfying meal by itself. It combines spicy sausage, citrusy kale, savory caramelized onions and slightly tart Wisconsin kasseri cheese, which melts perfectly. I recommend serving it alongside a jammy Cabernet Sauvignon to help balance the saltiness of the sandwich. This spicy Thai chicken salad wrap is a great flavorful and healthy alternative to the typical heavy mayo-based chicken salad recipes. Packed with peanut-y awesomeness, the sesame peanut dressing is loaded with flavor and makes an amazing sauce for guilt-free chicken wrap. The herbs bring an unexpected pop of freshness to the sandwich while the Sriracha adds a flair of spice. And if you don't like heat, leave off the Sriracha and chilis and add a splash of lime juice instead. 1. If you don't have rotisserie chicken on hand, try boiling two breasts and shredding them with a fork. 2. Don't eat meat but still want to give this sandwich wrap a try?- don't worry! Try swapping out the sandwich with tempeh, grilled tofu, or broiled cauliflower. 3. If you don't have time to make the sesame peanut dressing by hand, simply buy the packaged variety from the store, taste it, and doctor it up with fresh lime juice, coconut milk, or sweet chili sauce. Leftover Butternut Squash or Pickled Beets? This meatless veggie sandwich is loaded with sweet roasted butternut squash steaks, crisp baby sprouts, briny pickled beets, cream avocado and a tangy cilantro and chive homemade yogurt spread between two slices of toasted multigrain bread. Don't like greek yogurt? Swap out the chive cilantro yogurt spread for some crumbled goat cheese or some feta cheese. Want a little more protein? Try adding adding freshly sliced rotisserie chicken or smoked turkey breast - both options would pair perfectly with the ingredients from this sandwich. Love Sriracha? Then You've Got to Check Out These Fiery Sandwiches!